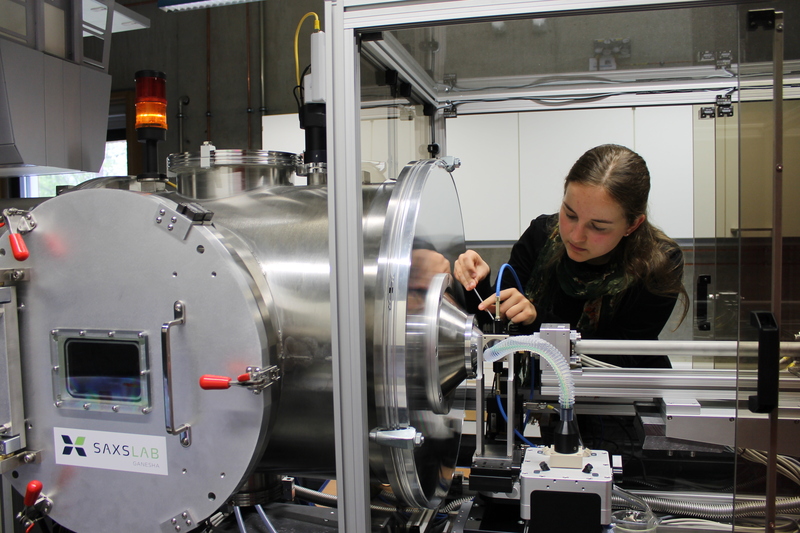 The main scientific instrument of our research group is the highly customized SAXS instrument constructed by SAXSLAB, Kopenhagen, in strong cooperation with our group. 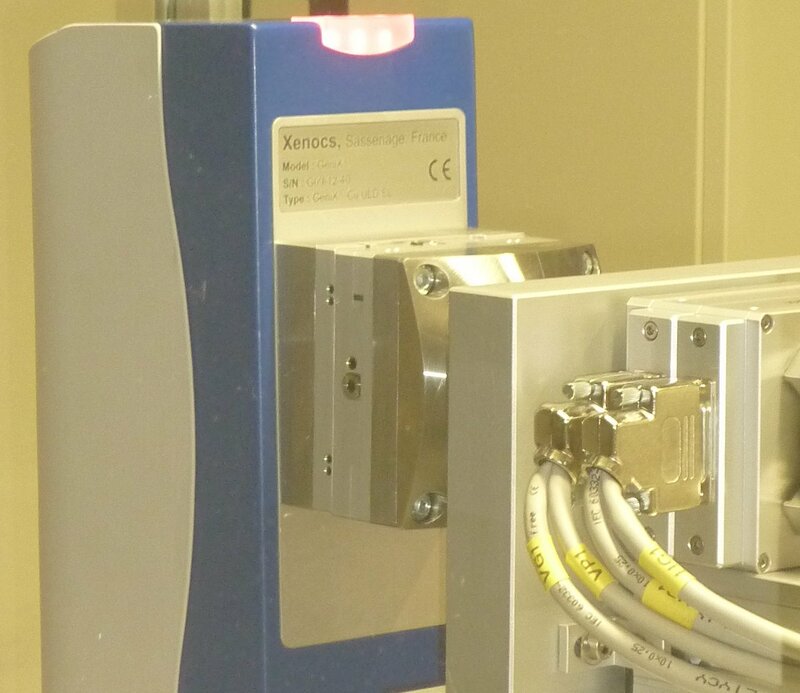 As X-ray source a 30 W Cu Kα microfocus tube (XENOCS, Grenoble) with a single bounce ultra low divergence mirror optics (XENOCS, Grenoble) is used. 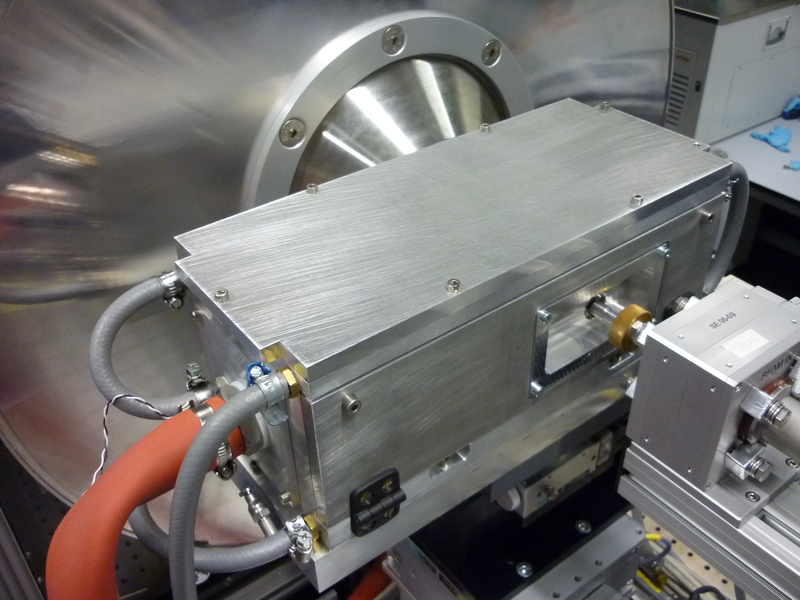 The instrument is already prepared to install a Ga-jet source (EXCILLUM, Kista). 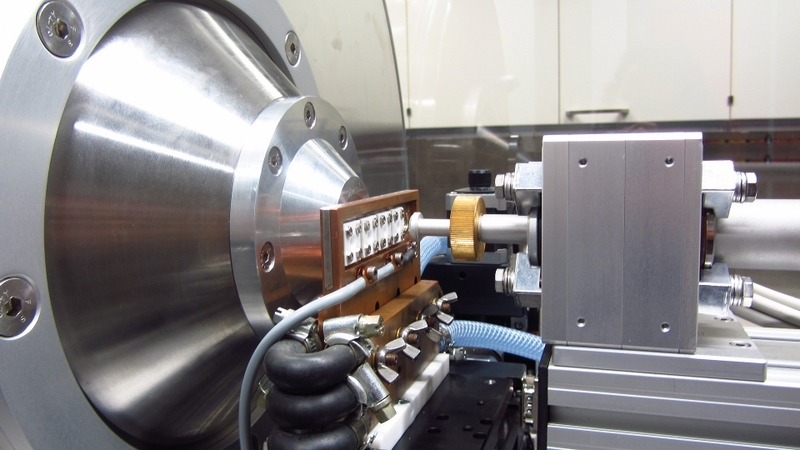 The instrument features an evacuated collimation line of variable length with up to 4 automated slit systems with 4 blades each (cf. Fig. 1). Two of the slit systems are equipped with scatterless blades of highly polished single crystalline silicon. The collimation line can be tilted and shifted with respect to the horizontal plane allowing GISAXS and reflectometry measurements of horizontally aligned specimen including liquid surfaces can be conducted. The whole collimation system including the X-ray source can be moved on a rail system in beam direction to adjust the space available for the sample environment. Particular emphasise has been focused on the variability of the sample environment. Thus bulky sample environments can be installed in front of the detector tube. The position of the collimation system can be easily adapted. In the pictures of Fig. 3 several sample environments are exemplarily visualized. A second sample position is foreseen within the evacuated detector tube. Also here horizontal and vertical GISAXS studies are possible as for the sample position in front of the detector tube. Furthermore, sample detector distances below 40 mm can be realized in order to reach large Q-values. The sample can be monitored online by a ccd camera. Inside the 600 mm wide and more than 2000 mm long detector tube the PILATUS detector can be adjusted by automated control in all 3 spatial dimensions. The sample environment inside the tube is accessible by a huge door which gives enough space to handle samples and bulky sample environments also at this position. The plattform for the sample environment inside the tube can be disassembled. In this case the detector can be moved close to the X-ray window at the front of the detector tube which allows to detect large Q-values also for samples placed at the sample position in front of the detector tube. The SAXS instrument is equipped with a PILATUS3 300 K (DECTRIS, ). The water cooled detector is operated directly inside the evacuated detector tube. It has a maximum frame rate of 500 Hz and a readout time of about 1 ms. The sensitive detector area amounts to 83.8 mm x 106.5 mm. Another important advantage of the SAXS instrument is that all interfacees are disclosed. The whole system is fully motorized and automated and controlled by the SPEC instrument control software. For data reduction the SASfit program is used. Some pictures which document the installation of the SAXS instrument are assembled here.